The Southern Business Journal recently released their list of 20 reader-nominated outstanding southern Illinois leaders under the age of 40. 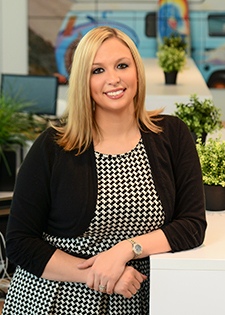 A College of Business alumna, Ashlee Church (Management '09, MBA '10), was one of the nominees. Below are Ashlee's answers to the to Southern's questions. What has been the key to your success so far? The relationships that I have built throughout Southern Illinois have been the key to my success thus far. I am blessed to have mentors both inside the automotive industry as well as outside the industry. Throughout my career, I have never been afraid to reach out to other leaders and mentors for support. I feel fortunate to work in a community with like-minded individuals who are working to grow our region and who are always willing to lend a hand anytime I have asked for guidance! What trait do you admire most in others? Why? The trait I admire most in others is perseverance. I believe the key to persevering in today’s business environment is passion. I have a great level of respect and admiration for leaders who are determined to succeed despite the many challenges faced in today’s business environment.